American Water Works Company (AWK) has delivered superior operating, financial and stock price performance over the past eight years. Its 2018 performance did not match the eight year average in either absolute or relative terms. However, management is confident in the company’s ability to achieve EPS growth “at the high end” of its 7%-10% guidance range over the next five years. While that seems like a bold assertion after eight years of superior earnings growth, the stock will likely continue to outperform peers, if management achieves its five-year targets. Outperformance vs. the broader market will depend upon other factors, such as interest rate and economic growth trends. American Water Works is the largest publicly-traded water utility in the U.S. Its current equity market capitalization of $16.8 billion exceeds that of all other publicly-traded water utilities combined. AWK is also a component of the Dow Jones Utility Average. With regulated operations in 16 states, American Water Works is also the most geographically diversified water utility. It has approximately 3.4 million customer connections and serves an estimated 12 million people. That geographic diversity helps mitigate the effects of weather on its financial results. AWK’s mission is to provide clean, safe, reliable and affordable services water to its customers. Its large operating scale helps it to achieve its mission by providing the resources and talent to support in-house functional capabilities, such as a centralized research and development function, staffed with 15 scientists, including 7 with Ph.D.s. Best practices are identified locally and shared across its operating regions. 2019-2023 Capital Investment Program. In order to fulfill its mission, American Water has been investing heavily in recent years to upgrade and modernize its regulated water and wastewater infrastructure. From 2015 to 2017, it incurred $3.73 billion of capital expenditures in its regulated businesses. Capital spending was likely around $1.5 billion in 2018. The company anticipates capital spending in its regulated businesses of $7.3 billion over the next five years, including $1.6 billion in 2019. About 62% of that 2019 capital budget is for infrastructure renewal. The remainder is targeted to improve operating efficiency, water quality and resiliency and for system expansion. Over the same period, I calculate that the average annual cost of water service per customer increased by just 2.2%. By components: the average cost per gallon during this period increased by 3.1%, but this was partially offset by a 0.9% annual decline in water volume per customer. Through some combination of conservation and the installation of more efficient appliances (weather does not appear to have been a factor over this three year period), customers have reduced their water usage, which has limited the increase in their annual cost of water service. The average 2.2% increase in annual water service costs is roughly in line with inflation. The Importance of the O&M Efficiency Ratio. American Water’s ability to keep the average increase in customer bills to 2.2% was aided by its focus on improving its adjusted operation and maintenance (O&M) efficiency ratio for its regulated businesses. That ratio, equal to O&M expenses divided by revenues, decreased from 35.7% in 2015 to 33.5% in 2017. In fact, the ratio has fallen steadily over the past seven years. The decline in the O&M efficiency ratio has kept regulated operation and maintenance expenses essentially flat over the past three years, even as regulated revenues have increased at a 3.4% compounded annual rate. To achieve this result, the company has been able to hold the line on O&M expense components, such as production costs, employee-related costs and operating supplies & services, while reducing customer billing and other costs, helped perhaps by the decline in water volumes. American Water’s ability to keep O&M costs flat has helped it to achieve its balanced objective. It has earned its required rate of return on capital investments and contained the increase in customer bills at the same time. 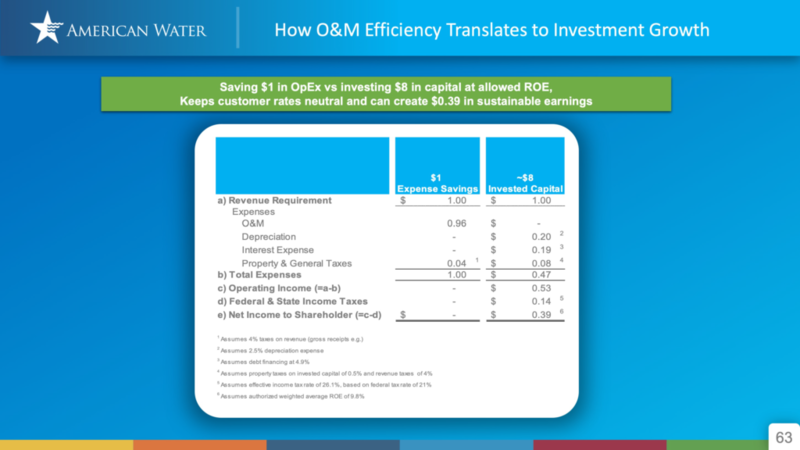 In the Appendix to its 2018 Investor Day presentation deck, the company included a slide (shown below) which demonstrates how this trade-off works: According to AWK, a $0.96 savings in O&M costs offsets the revenue requirement (to achieve its targeted return) on $8 of capital spending, while at the same time potentially creating $0.39 in sustainable earnings. According to that slide, AWK needs to generate roughly $1 in revenue (actually $1.015, according to my calculations) for every $8 in capital spending to achieve its allowed ROE of 9.8%. Thus, its $7.3 billion capital spending plan will require about $925 million in additional revenues (by the end of the 5-year period). With anticipated 2018 revenues of $2.82 billion, this translates into a revenue increase of nearly one-third to $3.75 billion or at an average compounded annual rate of about 6% to 2023. If water volume remains flat over this period – which might be an optimistic assumption, given that water volume declined by -0.4% annually from 2014 to 2017 – then the company would have to raise prices by 6% annually (without any other adjustments) to achieve its rate of return objective. However, American Water is also targeting a reduction in its regulated O&M efficiency ratio from 35.7% for the 12 month period ended Sept. 30, 2018 to 31.5% in 2023. According to my projections, that would result in an average annual increase in total O&M expense of just 0.4% annually and reduce the average annual revenue growth requirement for the regulated water business from 6% to 3.3%. Although above the current rate of inflation, a 3.3% average annual increase in regulated water revenues, even if achieved mostly by raising prices, would probably be acceptable to most state water utility regulators. A key question, therefore, is whether American Water can sustain the improvement in the O&M efficiency ratio over the next five years. The company has already reduced that ratio from 40.7% in 2012 to 33.8% in 2017. During that period, actual adjusted regulated O&M expense (which excludes purchased water and allocated costs) declined by 0.5% annually from $979 million to $956 million. That compares with an average annual increase in the headline CPI of 1.3%. American Water ability to achieve operating efficiencies that led to the reduction in its O&M efficiency ratio in recent years makes it confident that it can continue to reduce that ratio over the next five years. Still, the company has benefited from low commodity prices (especially energy costs) and generally low wage increases in achieving these results. American Water’s ability to achieve its O&M efficiency ratio target of 31.5% will therefore be a key determinant of its ability to continue to realize its targeted rate of return on invested capital and limit the increase in customer bills. Earnings Projections. Success in achieving this O&M/capital spending trade-off is also therefore a key determinant of American Water’s ability to achieve its 2019 and 5-year financial targets. Management’s 2019 guidance anticipates 2019 EPS of $3.54-$3.64. At roughly the midpoint of $3.60, this would represent a 9.1% increase over the rough midpoint of its current 2018 adjusted EPS guidance of $3.30, which is also the consensus estimate. Longer-term, management projects that EPS will grow “at the high end” of its 7%-10% targeted EPS growth range. It anticipates that the annual dividend will grow at the same 7%-10% rate, which would keep the payout ratio constant at 56%. Management expects that under normal operating conditions the company can achieve these results without issuing new equity. It is targeting a debt-to-total capitalization ratio of 62%-63% in 2023, up only slightly from an anticipated 61% in 2018. This should allow it to maintain its solid investment grade unsecured debt ratings of A3 by Moody’s and A by Standard & Poor’s. Valuation. This earnings projection profile also supports the company’s current equity valuation. At the current price of $93.74, the stock is valued at 28.5 times anticipated 2018 adjusted earnings of $3.30 per share and 26.2 times projected 2019 earnings of $3.60 per share. Both multiples are below AWK’s peer group averages of 29.3 and 26.8, respectively. AWK’s dividend yield of 1.9% is modestly below the peer group average of 2.1%. Its long-term earnings growth target of 7%-10% is within the range of its peer group. Investors are apparently satisfied with the industry’s historically high forward P/E multiples and price-to-earnings growth (PEG) ratios of about 3.0 times, even though the relatively strong price performance over the past few years has pushed average dividend yields for the water utility sector to historical lows. On the surface, the shares of AWK and its peers seem priced to perfection, with little room for earnings that fall short of expectations. But investors have obviously been willing to pay up for the higher perceived safety, given that water utilities have traditionally had less exposure to the downside of the business cycle. Even so, the sector probably has greater exposure to economic and financial market risks today, including the risks of rising interest rates, oil and natural gas prices and the possibility that state regulators may become less enthusiastic about supporting high capital spending levels if consumer budgets are pinched in the next downturn, making them less able to afford future rate increases. Assuming no major changes in interest rates, energy prices and the growth rate of the economy, however, and also assuming that the company can deliver on its key operating objectives (especially its ability to achieve further sustainable reductions in its O&M efficiency ratio), AWK’s forward P/E multiples should remain stable going forward. That establishes a target return for AWK’s stock of roughly 10%-12%, which is equal to the 8%-10% projected earnings growth rate plus the dividend yield of 1.9%. Under those assumptions, my one-year price target for AWK is $101-$103. Many investors have been drawn to AWK and its peers in recent years by their increasing focus on environmental, social and governance (ESG) issues. Beyond just the financial returns, they want to invest in companies that are making a positive impact on the communities that they serve, companies that “do well by doing good.” Similarly, I believe that investors who are also AWK customers should own the stock and stay up-to-date on its activities and performance. This entry was posted in AWK, Utilities and tagged American Water Works. Bookmark the permalink.